Simplicity: An AFA contract takes into account the total sum of all fees, disbursements, and discretion requests, simplifying administrative processes. Predictability: AFAs provide the law firm with predictable income and the client with predictable costs. It’s a win-win. Increased Autonomy: With AFAs, law firms determine how much time to allot for a particular matter as well as the power to determine costs based on the complexity. Flexibility: AFAs are not cookie-cutter agreements. The client and law firm work together to build the AFA contract based on their unique capabilities and needs. Transparency: Clients can be confident that they are receiving efficient, timely, and high-quality legal services because the law firm has additional incentive to do so. With the many benefits AFAs provide, corporate legal teams need the ability to set, manage, and enforce them strictly and accurately – this is where a legal operations management platform, like SimpleLegal, can help. In many cases, the traditional billable hour can present unnecessary risk and may not make sense to use. Legal services like obtaining immigration visas, tax assistance, or filing for patents, provide a prime opportunity to use AFAs, but many legal technology solutions aren’t flexible enough to effectively enforce these arrangements. Fixed fee or flat fee – Charging for a predefined legal service at a fixed or flat rate. Fixed total costs – Charging for an engagement at one total cost. Task-based fees – Identified tasks or components of the transaction are used to measure the fee. This arrangement may also be used in complex litigation or transactional matters where budgeting is required by the client. Blended rates – Instead of specific hourly rates for individual timekeepers, one rate is applied to all hours billed on a matter regardless of whether it’s for a partner, associate or paralegal. Volume discounts – A discount given based on the volume of purchased legal services. Matter-specific rate against various rate cards – Set of timekeeper classification rates defined at the matter-level. 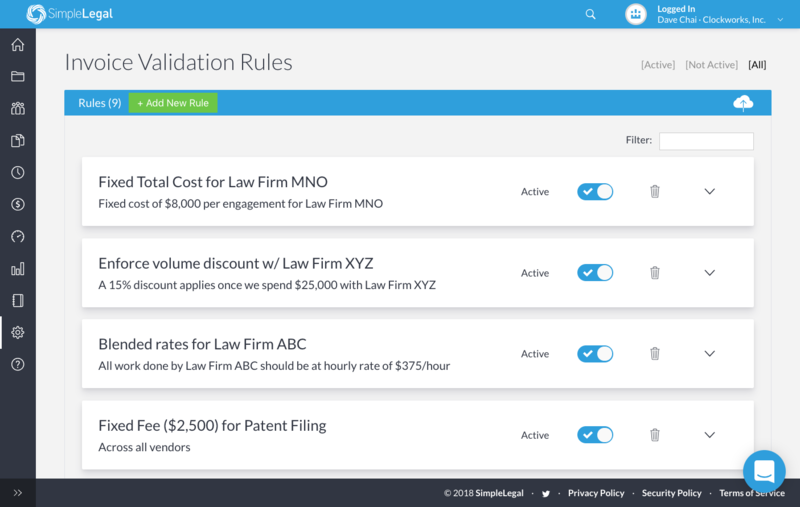 For more information on SimpleLegal’s AFA enforcement, please schedule a demo or contact sales@simplelegal.com – one of our experts will be in touch to answer any questions you have.